Good hardware marred by TouchWiz. Suprb screen; Good all-round camera; Great sound quality; Waterproof body; Good battery life. Doesn't look premium; Gaudy UI; Noticeable lag at some places; Uncomfortable for single-handed use; Expensive. The Samsung GALAXY S5 doesn’t need any introduction. It’s the phone that sold 11 million units in the first month of launch. The handset is already a global hit, we are not going to gauge its success. Instead of that, this article will help you decide whether it’s worth spending Rs 40,000 for Samsung's latest flagship smartphone. 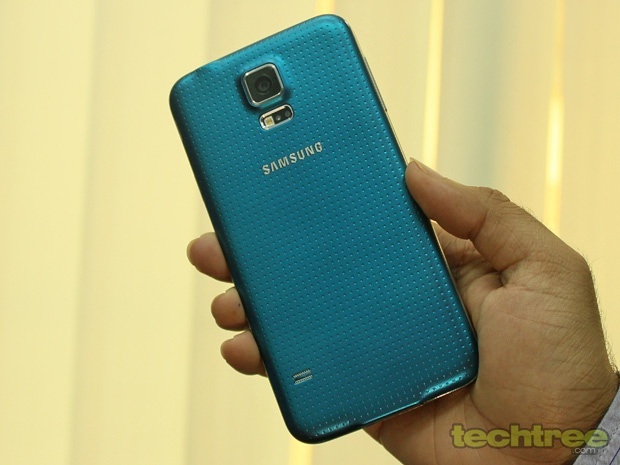 The GALAXY S5 looks very similar to its predecessor the S4, save for the textured back. Aesthetically, it’s a step down — the perforated pattern on its back looks unpleasant. 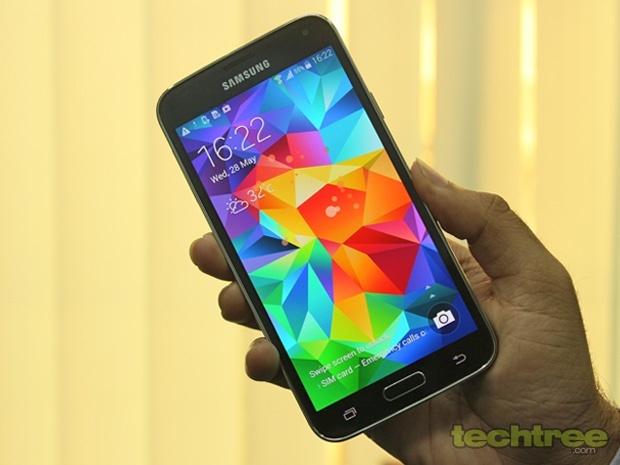 Be it the design or the use of plasic, the GALAXY S5 doesn't feel premium at all. It is nowhere near its biggest competitor the iPhone 5S in terms of looks. The phone features an all-plastic body with faux-metal finish on its sides. As many of you would already know, the metallic paint on the handset’s sides goes away in few months. Considering that the handset costs a lot of money, why is Samsung is using plastic with chrome finish instead of an metal frame? Boring looks aside, the S5 is quite sturdy. What’s more, the S5 adheres to (Ingress Protection) IP67 standards. In simple words, the phone is dust and water resistant. The first digit refers to protection against solid. So the GALAXY S5 is totally protected against dust (IP6X), and can survive water immersion up to 1 meter (IPX7). This feature will come in handy for monsoons. Like all the Samsung flagship devices, this one is too big for comfortable single-handed usage. The company has retained the tried-and-tested physical home button and a mcouple of capacities keys. The contextual 'Options' button has been replaced by a dedicated 'multitasking' key. Most GALAXY users will initially find it confusing, but won’t take over a couple of days to get used to it. There's a micro-USB 3.0 and a separate MHL 2.0 port at the bottom, sealed by a waterproof lead. On the right is a Power / Lock button, and volume rocker is placed on the other side. The phone features a 5.1-inch AMOLED screen with Full HD resolution. The display is absolutely brilliant. Be it sharpness, or colour reproduction, the screen excels in all departments. The Colours pop-out and the blacks actually look black (unlike dark grey as seen on most LCD screens). If you don’t like vibrant colours, you can choose a different screen mode from settings. Similar to high-end Lumia handsets, the S5 comes with a super sensitive screen that can be operated with gloves on. It’s protected by Corning’s Gorilla Glass 3, which means it won’t get scratched easily. To sum it up, the GALAXY S5 sports a best screen in the market. The Indian variant of the GALAXY S5 comes with Samsung's very own octa-core Exynos 5422 chipset. The phone has 2 GB of RAM, 16 GB internal storage, microSD card slot, and 2800 mAh battery. Other fancy stuff includes a fingerprint scanner (integrated in Home button), heart-rate monitor (placed near camera flash), and Infrared port (situated at the top side). The handset offers Android 4.4 Kitkat with Samsung's TouchWiz UI. The interface elements are flat compared to the previous iteration. The colours have been a bit toned down. But, the overall UI is still overwhelming and cluttered. As usual, the icons lack uniformity in terms of design. For instance, Hangouts and ChatON icons are tiny whereas Play Newsstand and Smart Remote icons are unusually big. The notification bar is loaded with plenty of information and options. Apart from the Wi-Fi, GPS, and Silent mode toggles, you get a brightness slider right there. At many places the phone offers more information than a user can comprehend. Moreover, there are features such as Smart pause, Smart scroll, Air Gestures, and Multi-Window that look good on paper, but aren't practical. Smart pause is the feature that pauses the video playback when you look away. Nice concept, but it's a hit and miss affair. With Smart Scroll, you can scroll a webpage by rolling eyes (yes, literally). This is pointless since a finger swipe is a more reliable and faster way to scroll. Multi-Windows lets you run two apps in split-screen mode. That's basically adding more distractions to an already cluttered interface. The phone runs CPU intensive games such as Real Racing 3 and Modern Combat 4 without any issue. However, it stutters during menu navigation. It also takes around two seconds to open contact book. This could be because of the octa-core processor setup that comprises of two quad-core processors (Quad 1.9 GHz + Quad 1.3 GHz). These two quad processors have different clock speeds and they don't work simultaneously. So to perform light tasks it utilises low-powered CPU, and the 1.9 Ghz CPU takes over when you fire up a heavy game. In simple language, it's like having 8 wheels in a car. Four to drive slow, and the other set to be used at higher speeds. Similar to the iPhone 5s, Samsung's latest flagship sports a 'Fingerprint Scanner'. It's used for unlocking the phone and authorising app purchases. Unlike iPhone's TouchID where you have to place your finger on the sensor, the GALAXY S5's biometrics system requires you to swipe your finger on the sensor. The feature works fine most of the time. The Pedometer works perfectly. It lets you track the number of steps and distance you're walked through the day. This helps you find the amount of calories you burn each day. The S5 also comes with a unique heart-rate monitor, which works with Samsung's S Health 3.0 app suite. It seems to work. fine However, the problem here is that the S5 shows my reading at around 100 / minutes, while the company’s very own Gear Fit’s readings fall between 75 and 80. I don’t know what gadget to believe here. The GALAXY S5 offers a feature-packed music player. It offers usual set of equaliser settings and sound enhancements. Smart Volume feature that works as a sound normalizer. For a premium handset, the earphones are quite ordinary. But, the device's sound output is top-notch. In terms of video playback support, the S5 covers almost every popular format including AVI, MP4, MKV, and WMV up to 1080p. There's pop up play feature that enables you to watch videos in a small, widget-like window. This allows you to view a clip even while browsing or sending a text message. Again, this is one more useless feature. The camera module has been upgraded to 16 megapixel. It's very quick at focusing objects. The camera also packs in interesting features such as Selective Focus and 4K video recording. The user interface has been changed a bit. Modes such as Beauty Face, Shot & more, Panorama, Dual Camera do take a lot of space, but are less obtrusive compared to what we had on the S4. The camera produces great images with in well-lit conditions. The photographs contain plenty of details. However, the colours look a bit off. Probably due to post processing. Samsung has considerably improved in terms of low-light photography. The S5 performs a lot better compared to its siblings and predecessor. Though don’t expect it to beat Nokia’s 925 and 1520 yet. The phonebook is a standard TouchWiz affair: Swiping a contact to the left results in composing a message, while swiping it to the right lets you call the person. Even better, holding the S5 to your ear automatically dials the number you were browsing. The phone's call quality and network reception are very good. Moving on to messaging, the on-screen keyboard is poorly designed. Instead of utilising the space to fit in bigger keys, Samsung has wasted it in the form of spacing between the characters. It's not a laptop guys, we don't need a chiclet keyboard on a phone. The S5 packs in a 2800 mAh Li-ion battery. That’s 200 mAh more than what you get with the GALAXY S4. In our 720p video loop test with brightness set to 60%, it lasted for 11 hours. Under normal use, it easily lasts for a day and half. For an Android phone with a full HD screen and octa-core processor, the battery performance is great. The Samsung GALAXY S5 packs in an impressive screen. The camera and waterproof body are two more strong points of this phone. What brings it down is the cluttered interface and noticeable lag in performing certain tasks (in spite of a powerful octa-core processor). The design just can’t justify the phone’s premium price tag. If you’re spending around Rs 40,000, you better stretch your budget a bit and get the HTC One M8 instead. If you want to stick to Samsung, buy the GALAXY S4, which is now available for Rs 28,000. What you’re going to miss here are a bunch of sensors and water-resistant body. The best part is that you buy the S4 and pretend that you’re using the S5. Trust me very few people will be able to catch your bluff.